England seized their first Grand Slam since 2003 with a tense 31-21 victory over France in Paris to complete a triumphant debut campaign at the helm for Eddie Jones. Tries from Danny Care, Dan Cole and Anthony Watson ensured there was no repeat of past failures at the final hurdle -- most recently in Dublin five years ago -- on a glorious night for a team that had fallen so far short of expectations at last autumn's World Cup. The celebrations looked like being muted, after captain Dylan Hartley was knocked unconscious during a tackle in the 68th minute and had to be carried from the pitch on a stretcher after receiving lengthy medical treatment. But a proud Hartley was back on the pitch after the final whistle and lifted the trophy as England's celebrations began. 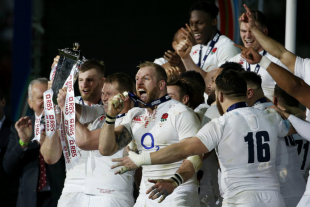 England had claimed the RBS 6 Nations title with a round to spare, but masterminding a 13th Red Rose Grand Slam was Jones' clear objective and the Australian delivered on the 120th day of his reign to follow up a sequence of four successive runners-up finishes under Stuart Lancaster. 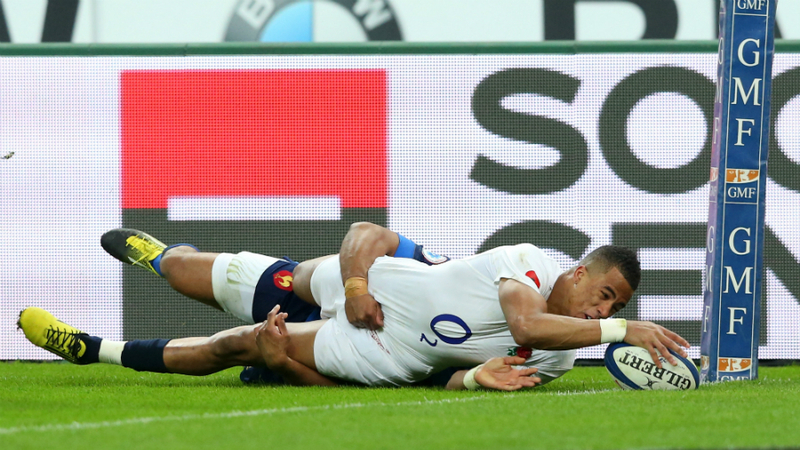 Jones had predicted the opening 20 minutes would see France at their best, but it was the new champions who dominated the scoreboard through tries from Care and Cole. Care had been picked ahead of Ben Youngs in the belief his energy and pace would help nullify Les Blues' early endeavour and it proved an inspired selection as the scrum-half used his wits to plunder an opportunist score. But having led 17-6 after the first quarter, England were reeled in to 20-18 with the kicking of Maxime Machenaud punishing their indiscipline time and again. They entered a pivotal phase of the match determined to ensure the year 2016 was not added to the lengthy list of final-day implosions and responded brilliantly, Watson adding a third try before the kicking of Owen Farrell swept them clear. Jones had braced his players for French dirty tricks during their warm-up, but the rogue cockerels and marching band predicted to interfere with final preparations by the Australian failed to make an appearance. Instead, the first act of foul play came from England at the kick off when Watson took Gael Fickou out in the air and once Maro Itoje had been penalised for an illegal poach at the breakdown, Machenaud kicked France ahead. Farrell levelled the score via a kind bounce off the right upright, but at least one of Jones' predictions was proving accurate as the French continued their blazing start -- assisted by some weak defending -- amid a frantic opening. Mike Brown handed off a tackle by Fickou but was unable to deliver the scoring pass to Harlequins team-mate Care before play swung back into England's half with their right wing probed repeatedly. It was France's turn to go missing in defence in the 12th minute and the ultra-alert Care pounced, exploiting a big gap at the breakdown to race over from 40 yards out. And the home side crumbled far too easily for a second time eight minutes later when, several phases after Watson had caught a crossfield kick, Cole shrugged off Scott Spedding to barrel over. Their dire defending for the two tries aside, France were far from a lost cause as every time they attacked they made ground and with better handling they would have crossed the try-line themselves. Machenaud landed a third penalty, but that was the prelude to a patient attack from England who offered Brown a half-chance that the full-back was unable to finish. A French scrum was turned over five metres out, allowing the assault to be renewed with flanker James Haskell being used as the main battering ram in a period of sustained pressure from the champions. France had the final say of the half, however, when Machenaud was on target for a fourth time. Wing Virimi Vakatawa brushed aside a succession of tackles with worrying ease until Jack Nowell finally brought him down and then only Chris Robshaw's late intervention prevented Bernard Le Roux from crossing in the corner. Machenaud and Farrell exchanged penalties and the teams took it in turn to attack as an absorbing match continued to unfold, although the regular interruptions for penalties took their toll on the spectacle. A chaotic spell ensued, with each team seizing a turnover only to then squander it, and England's decision-making was falling short of the standard seen previously in the tournament. There was nothing wrong with their play in the 57th minute, however, as man of the match Billy Vunipola carried with intent, Ben Youngs sped free and chipped for Watson to gather and score in the right corner. The boot of Machenaud kept France in touch, but England were now spending more time in their opponents' half. Two penalties by Farrell then put them out of France's reach and with two minutes to go their supporters were able to begin the celebrations.